I got a response from them and they've said they can send me the green magnet holding part with another pair of magnets for £35. Bit of added weight for the ease of any-way-up mounting. I reckon I'll go for it - I can always put them on another pair of pedals so I have two pairs of magnetic ones if the weight gets annoying. Soo, I've been commuting on these MagPed pedals this week, and figured I'd post a bit more about them now I've gotten to grips (totally intended) with them. Firstly, due to the size of the magnet, it's not always a case of jumping on and being hooked on straight away, and finding the point where you get maximum hold is sometimes a bit tedious as it's quite easy to land in a way that the cleat is half-off the magnet, which causes you to be held well enough to struggle sliding it around, but not well enough to feel securely attached. This is getting better as I learn to wiggle my foot in place better, and actually means I can mount and dismount unclipped easily as I can just about wiggle my foot off the magnet when I see the light turn red. Not that it's really needed, as dismounting right off the magnet pretty much always works without issue. There have been no unintentional unclips yet, and it's easy enough to 'pull up' on the pedals (though in actual usage I don't actually think anyone does this even on two wheels, I certainly don't), so I suppose that means the pedals have enough holding power for my usage! I've got two different pairs of SPD shoes I've tested the pedals on - one is more of a road/CX pair, ie. minimal tread and a smooth plastic sole. 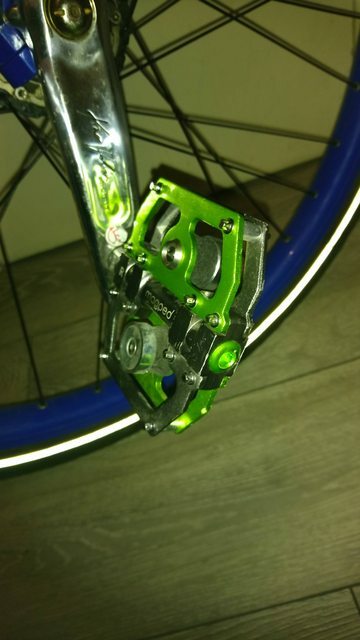 These are terrible, but I reckon that's only because the pedals are 1-sided and so if I botch the mount I'll be riding on smooth plastic against metal, which means disaster! My other pair are more MTB-ey and has a normal rubber sole around the SPD cleat hole, meaning I can still use them on the non-magnet side so I've stuck to these for now. What little tread is on my roadie pair is also a lot deeper than the MTB pair, and I struggled making the magnet on the pedal stick out enough to reliably connect, but maybe I'll give the roadie shoes another go at some point when I've got the dual-sided pedals sorted as they're much lighter (and cooler looking). OK, last post! I finally received a second set of magnet plates and bolted 'em on. I now have a double-sided pair of MagPeds! This should hopefully solve my biggest issue with the pedals. I've been using the MagPeds for all of my riding since my previous posts, and am happy to report that I'm yet to break my face. I've also upgraded all 4 magnets to the maximum strength ones, which has improved them considerably. I can't physically lift out of them anymore unless I use the 'peeling sideways' motion and do so very hard (The previous magnets would give if you pulled up hard enough). I usually don't peel sideways, I tend to push really hard forward to slide my foot off the magnet and onto shoe rubber while still riding, that way the dismount is a bit more graceful. One concern I had was that the magnets would unscrew a bit, but since putting the bigger magnets in this isn't a problem. I suppose they're thick enough that I can get a couple more turns on the screw to hold them in fully. So... I suppose, mission successful. The only downside really is the cost (Which, after adding four more powerful magnets and a second set of mounting plates, is considerable, but you might be able to contact them and just buy the lot as one thing and save some). That and the weight, which is a bit more than the cheapest non-caged SPD and about the same/a bit less than a caged SPD.